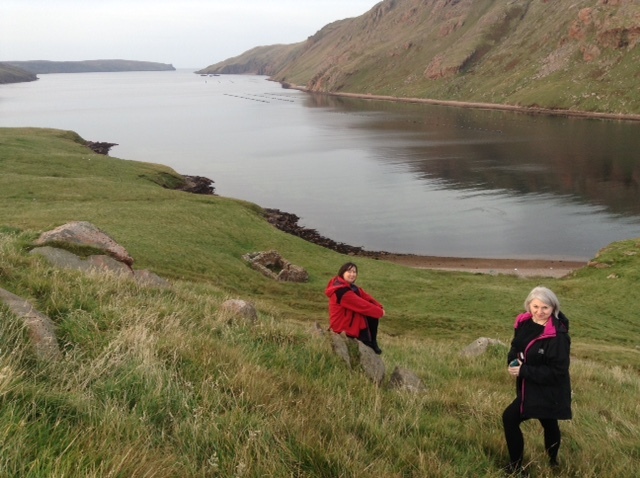 Research note 1: Jenny Gilbertson- Shetland research visit, October 2015. Heylor, Shetland- one of the locations for ‘Rugged Island’ (1932) Jenny Gilbertson. Thanks to research leave from The Glasgow School of Art, I have three months away from my role as GSA Exhibitions Director, to work in depth on one piece of written research. I will be looking at Margaret Fay Shaw (1904-2004), Jenny Gilbertson (1902-1990) and M.E.M. Donaldson (1876-1958), in particular their photography or filmmaking from the 1930s’, a period where all three women were independently documenting different aspects of Scottish Highlands and Islands life, having moved to live with the communities they were witnessing. My aim is for these posts to serve as an introduction or notebook to my research and as an aid to help record, excavate and edge closer to the key points to write about. As an early career researcher, this is the first experience I have had of working alongside other researchers on the same subject. I am incredibly lucky to be part of a motivated group of women all inspired by Shetland film maker Jenny Gilbertson– Shona Main, a writer and film-maker currently working on a biography of Gilbertson; Dr Sarah Neely, University of Stirling, who has written in particular about Gilbertson’s later work in the Arctic; and Joanne Jamieson from Shetland Moving Image Archive who is writing about Gilbertson and working to gather all Gilbertson’s films in the archive. I have been impressed by and grateful for their openness in sharing their knowledge and field work. My first research visit has been to Shetland and the Shetland Museum and Archives in Lerwick (thanks to Brian Smith, Blair Bruce and Angus Johnson), to look through their material on Jenny Gilbertson. This resource has mostly been gifted by her two daughters Helen Thomson and Ann Black who live on Shetland. 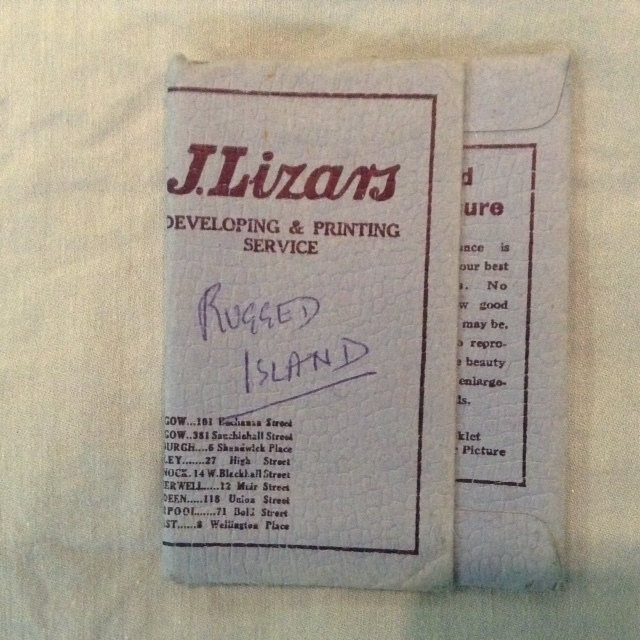 ‘Rugged Island’ photograph holder, Shetland Museum and Archives. These important holdings include Gilbertson’s correspondence over her lifetime, both personal and professional; the interpretation material she wrote about her work including autobiographical notes and film synopsis; press cuttings, in particular relating to her later filming in the Canadian Arctic with the Inuit; reflections and references from others about her work including a recommendation from her peer, filmmaker Elizabeth Balneaves (1911-2006), a letter and review of her early work by John Grierson (1898-1972) and feedback from the teachers and pupils of the schools she personally toured her films to; ephemera from film screenings and lecture tours that she undertook including some posthumous material; photographs from both her family and professional life, the latter including photographs from her early lecture tour to Canada in 1934-5 as well as from the period in her seventies and eighties living at Coral Harbour and Grise Fiord filming the Inuit; reference material she had compiled relating to subjects that interested her, both historical and contemporary; some of her film outlines and drafts, including a radio play ‘Busta House’ (1955) and essays she sent to magazines; and raw material including 35mm negatives from ‘Rugged Island’(1932) and ‘Prairie Winter’ (1934) as well as sound reels of recordings made in Coral Harbour and Grise Fiord. Shetland Museum and Archives have begun the process of cataloguing this collection. The importance of the archives has been threefold – to see how Gilbertson saw herself and her work, through her own words and through others; to gain insight into her motivations for filming; and to understand the conditions she had to navigate as an independent filmmaker throughout her career, including those with the film and TV industry. 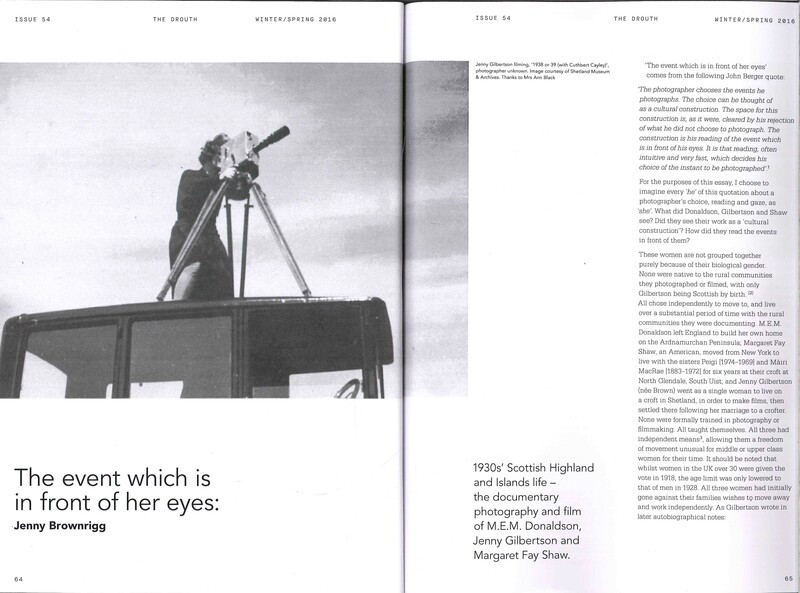 During the time I was in Shetland, Shona Main along with Shetland Moving Image Archive’s Joanne Jamieson, staged two screenings of Gilbertson’s 1930’s films (11 & 15 Oct 2015). 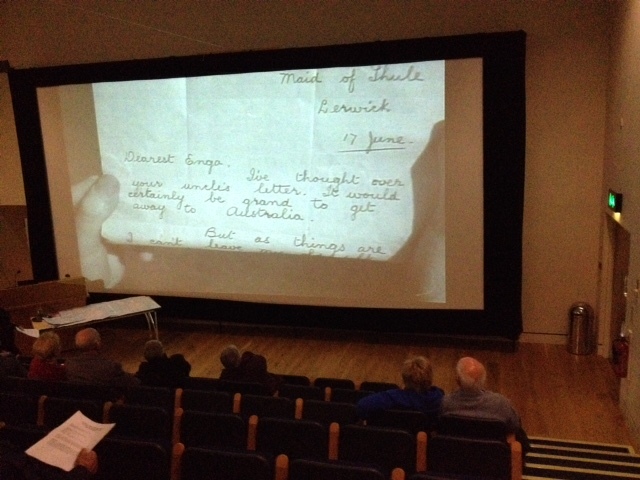 The first in Lerwick at Shetland Museum was a screening of ‘Rugged Island’ (1932), the sound version with original score by Kenneth Leslie Smith. 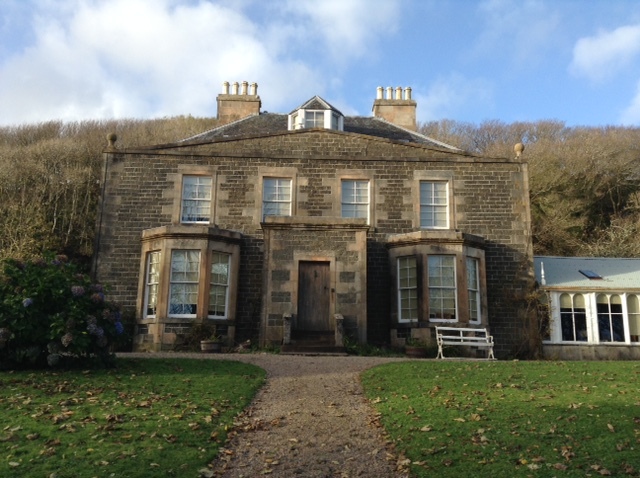 The second, to a packed village hall in Hillswick, where Gilbertson and her family had lived, showed her first film ‘A Crofter’s Life in Shetland’ (1931) alongside a number Gilbertson went on to make and sell to Grierson and the G.P.O. Library: ‘Cattle Sale’ (1932), ‘Da Makkin o’ a Keshie’ (1932), ‘Peat From Hillside to Home’ (1932) and ‘In Sheep’s Clothing’ (1932). 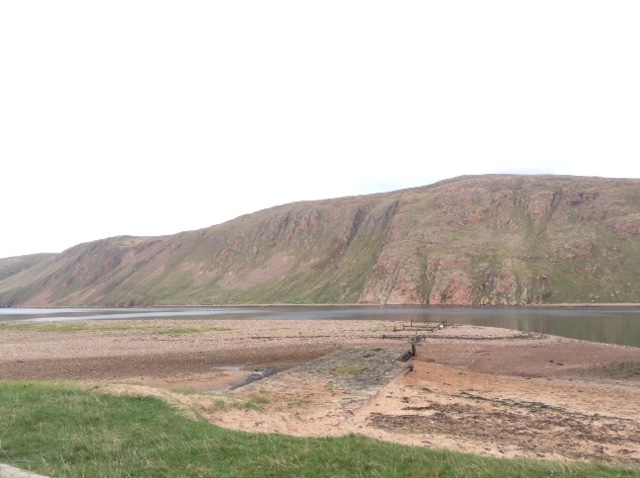 Site visit with David Anderson to Hillswick, Heylor and Eshaness. As well as showing these films, the aim of the screenings was for Main and Jamieson to find out and record from the audience if they knew the locations and people within the films. They did this following the screenings by going through the films again and using them as an ‘aide memoire’ to prompt discussions on who it was and where it was in different scenes. 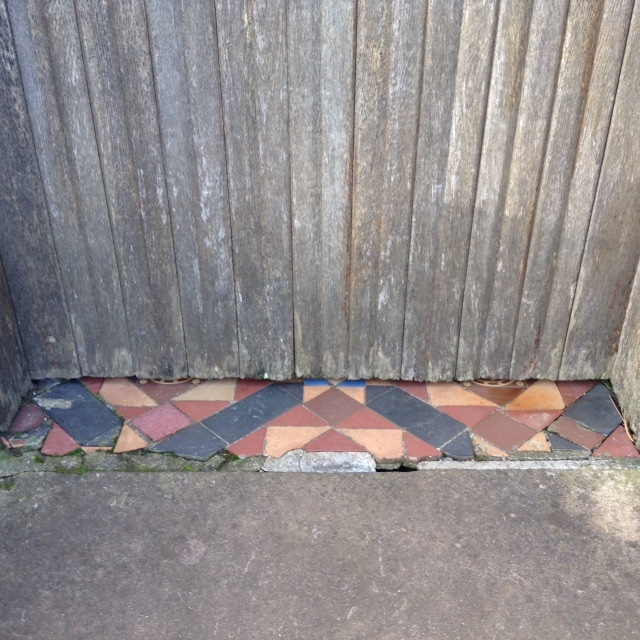 This proved to be a successful method, in particular leading to a subsequent site visit with David Anderson (Davie a’ Hammar), a member of the audience from the Lerwick screening who had been taught by Gilbertson at Urafirth Primary School. 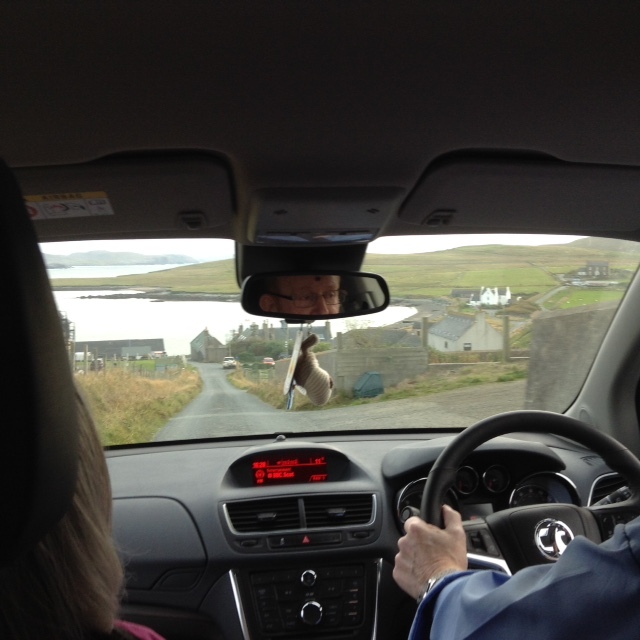 He drove Shona, Joanne and myself around Hillswick and Eshaness areas before the second screening, to locate the croft and ruined cottage that Gilbertson’s husband Johnny Gilbertson had worked on, at Heylor, for part of the ‘Rugged Island’ (1932) set. 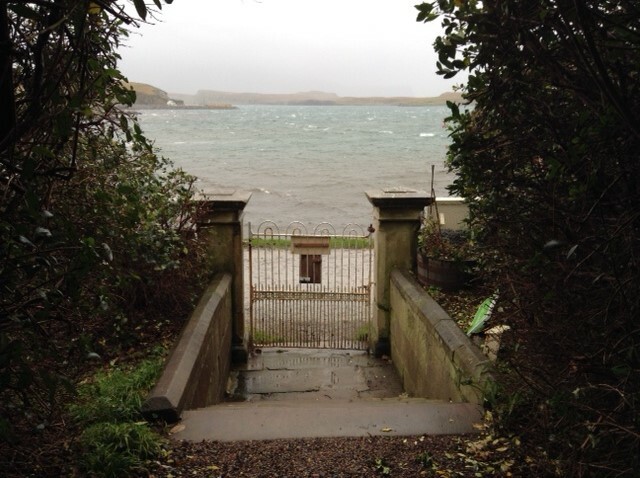 The experience of this research visit to Shetland has been immersive – from the darkness of the film screenings where people and places came to light, to the richness of material in the archives. 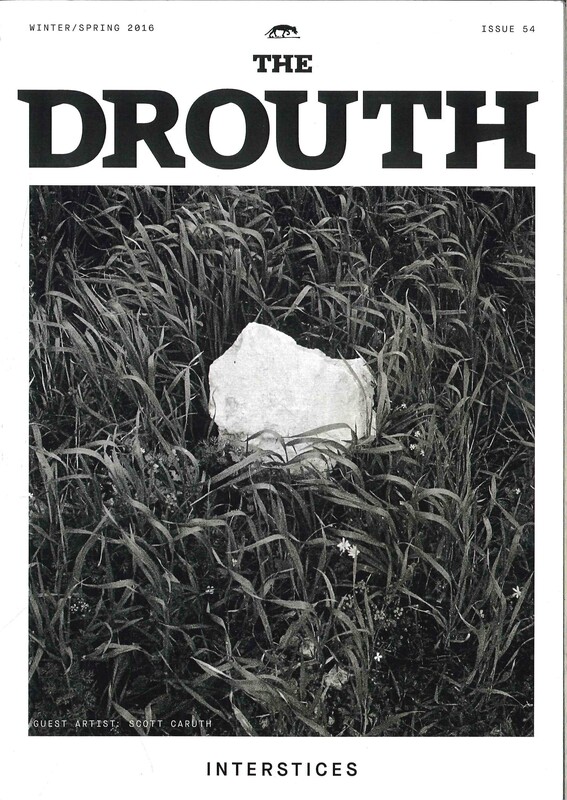 I had not contended for the feeling of exhilaration that results from the first connections to occur through research, source material, conversation and of being out in the landscape on the trail of Jenny Gilbertson.